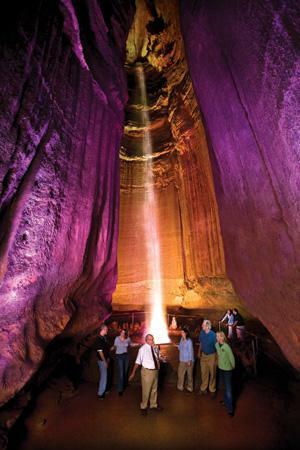 Ruby Falls holds the distinction of being America's deepest commercial cave and most-visited underground waterfall. Annual visitation exceeds 400,000. Transformation of our 80-year-old natural attraction, listed in the National Register for Historic Places, into a more sustainable and environmentally friendly business operation was a challenge we knew we needed to undertake. Ruby Falls is committed to the reduction of our environmental footprint while providing a better experience for our visitors. The process included hiring an outside environmental consultant - Dobbin Callahan of Skye Con Consulting, the formation of internal environmental management teams, and 3rd party audits. We have four main environmental initiatives: the production of renewable energy, reduction in greenhouse gas emissions, recycling and waste reduction, and land use planning. While our environmental journey will never be complete, we have made enough progress in these four areas to be the first U.S. attraction to successfully complete the Green Globe International environmental certification process.